Dr. Eugenie Brunner explains how combining upper and lower eyelid surgery can achieve more comprehensive results and reduce costs as compared to performing the procedures separately. Princeton, NJ — Aging is not the only contributor to heavy, hooded eyelids, Dr. Eugenie Brunner explains. The Princeton facial plastic surgeon says that genetic predisposition, adverse health conditions, and poor self-care can also cause puffy or sagging eyelids. Blepharoplasty, commonly called eyelid surgery, is a procedure designed to reduce excess skin and improve the appearance of the upper eyelids, lower eyelids, or both. Dr. Brunner indicates that many patients experience symptoms on both the top and bottom eyelids, and those individuals can often benefit from combining upper and lower blepharoplasty. She offers an informative resource to assist people researching this procedure. Many patients will be interested in the cosmetic benefits of eyelid surgery, Dr. Brunner states. Swollen or droopy eyelids, she suggests, can make someone appear tired, stressed, or older than they actually are. She says that there may also be functional advantages for individuals who have moderate to severe upper eyelid hooding. Dr. Brunner indicates that, in some cases, skin laxity can become severe enough to obstruct a person’s vision. Dr. Brunner says one advantage of combining upper and lower blepharoplasty is the ability to maintain a balanced, cosmetically appealing look. She says performing both techniques at once can allow the facial plastic surgeon to optimize the aesthetics of the entire eye region, rather than limit improvement to the top or the bottom lids. Dr. Brunner advises anyone considering this procedure to discuss their goals with a board certified facial plastic surgeon to determine whether a single or combination approach can maximize results. The cost of eyelid surgery is another significant concern for many patients, Dr. Brunner reveals. She says combining techniques can save money over performing the upper and lower procedures separately. Dr. Brunner adds that patients who prefer to pay for the operation in installments may want to consider financing options that offer reasonable payment plans. Ultimately, Dr. Brunner believes that eyelid surgery offers the greatest benefits when the operation is customized to suit the needs and goals of the patient. 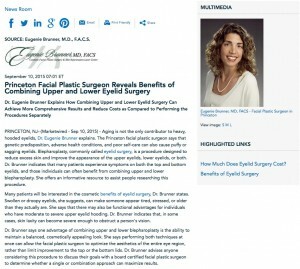 While combining upper and lower blepharoplasty can offer advantages to the right individual, she says each person will have unique factors to consider. These distinctive variables, she emphasizes, should be the foundation for the treatment plan. Dr. Brunner is board certified in Facial Plastic and Reconstructive Surgery as well as Otolaryngology. She earned her undergraduate degree from Rutgers College and her medical degree from Robert Wood Johnson Medical School—The University of Medicine and Dentistry of New Jersey. After graduating with honors, she completed additional medical training at New York University Medical Center and the University of Toronto. Dr. Brunner is a two-time recipient of the Patients’ Choice Award and a six-time recipient of the Castle Connolly Top Doctor Award for New York/New Jersey. Dr. Brunner is available for interview upon request.